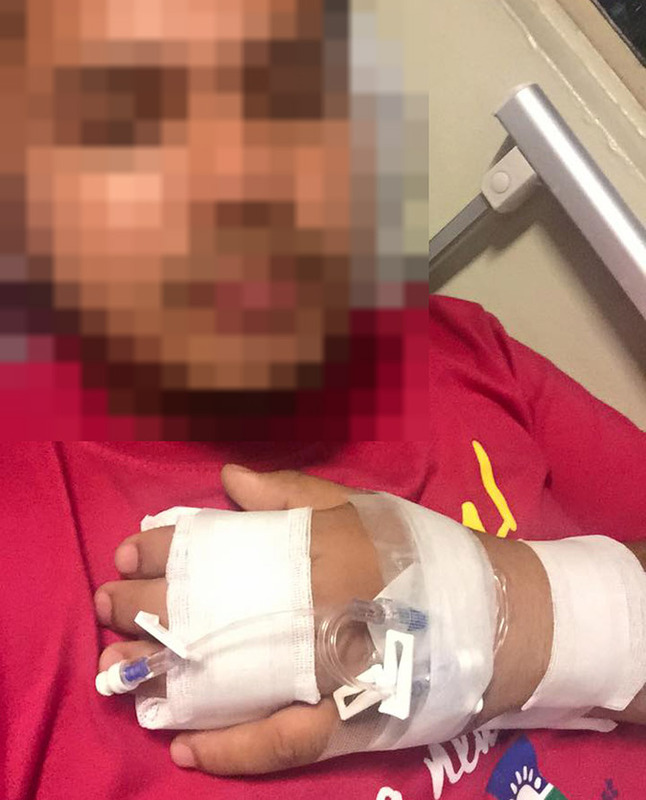 Kelvin, the Uber driver who became subject of a viral Facebook post from a mother of a female rider, posted a response to clear his name. My daughter"s UBER ride experience Last night was so frightening and nerve wracking. This hasn't been her first time to ride uber. She takes uber whenever her class ends at9pm or when I am not able to fetch her. We are a family of uber car users. Her 3 Other sisters are uber regulars. We thought it is safe and reliable. We thought UBER has a good screening process for drivers. 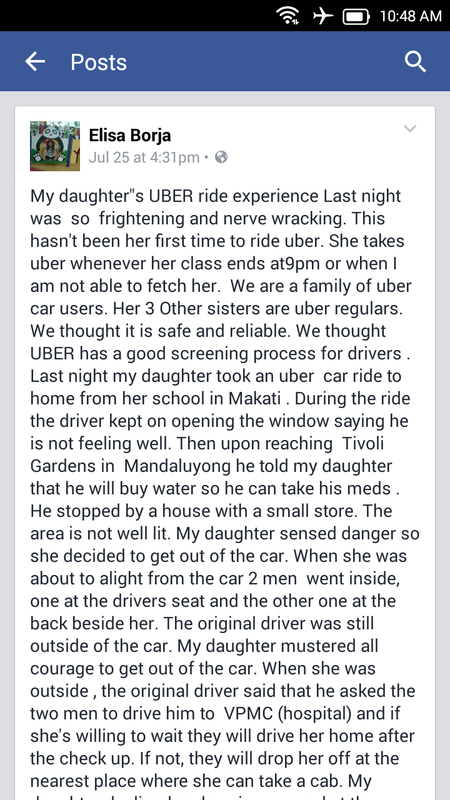 Last night my daughter took an uber car ride to home from her school in Makati. During the ride the driver kept on opening the window saying he is not feeling well. 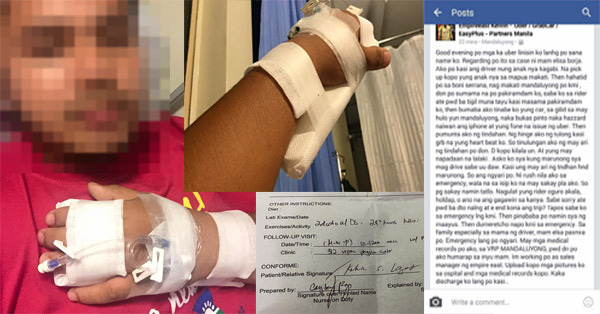 Then upon reaching Tivoli Gardens in Mandaluyong he told my daughter that he will buy water so he can take his meds. He stopped by a house with a small store. The area is not well lit. My daughter sensed danger so she decided to get out of the car. When she was about to alight from the car 2 men went inside, one at the drivers seat and the other one at the back beside her. The original driver was still outside of the car. My daughter mustered all courage to get out of the car. 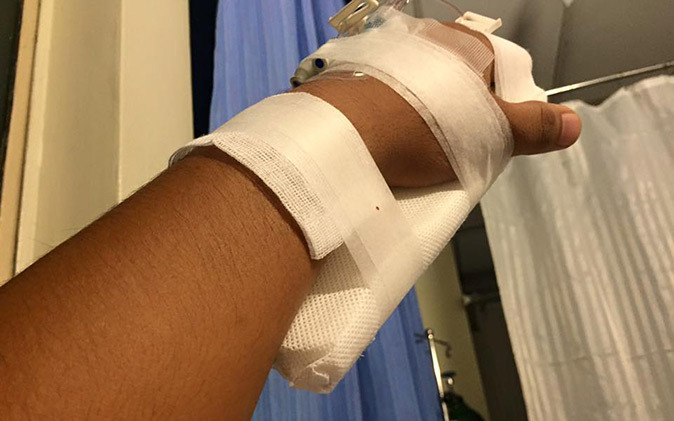 When she was outside , the original driver said that he asked the two men to drive him to VPMC (hospital) and if she's willing to wait they will drive her home after the check up. If not, they will drop her off at the nearest place where she can take a cab. My daughter declined and seeing a guard at the Tivoli Garden she went to that direction and the UBER car sped off. If the driver was not feeling well then why did he accept the booking. We complained last night to UBER BUT WE DID NOT GET A RESPONSE. We thought that"s the end of it. The driver is texting my daughter. 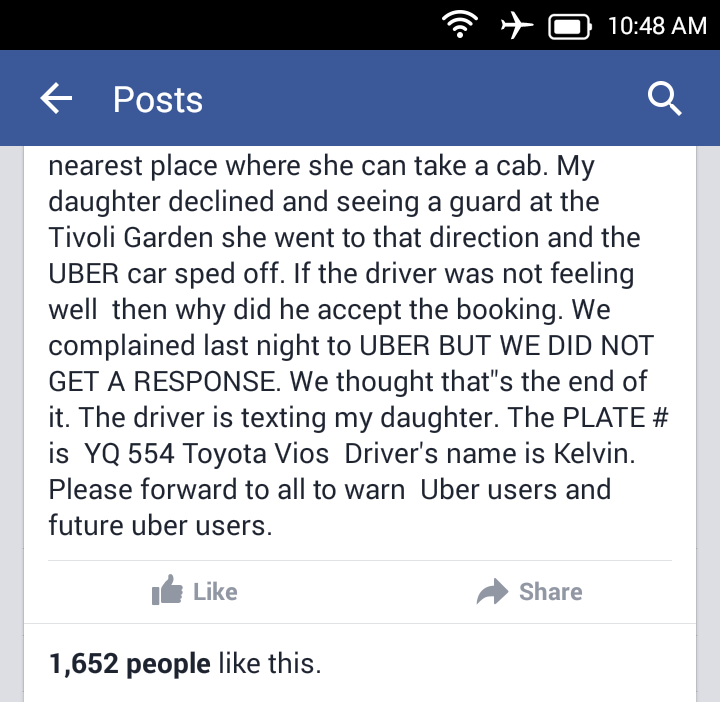 The PLATE # is YQ 554 Toyota Vios Driver's name is Kelvin. 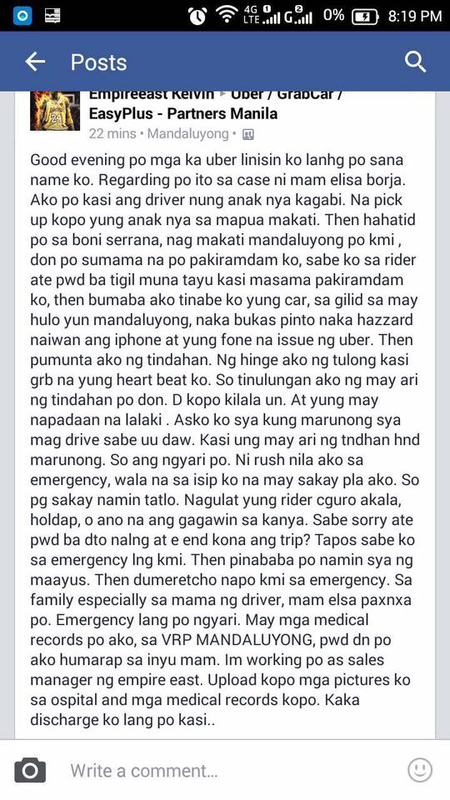 Please forward to all to warn Uber users and future uber users. Kelvin, who introduced himself as sales manager of Empire East Land Holdings, also turned to social media to air his side. 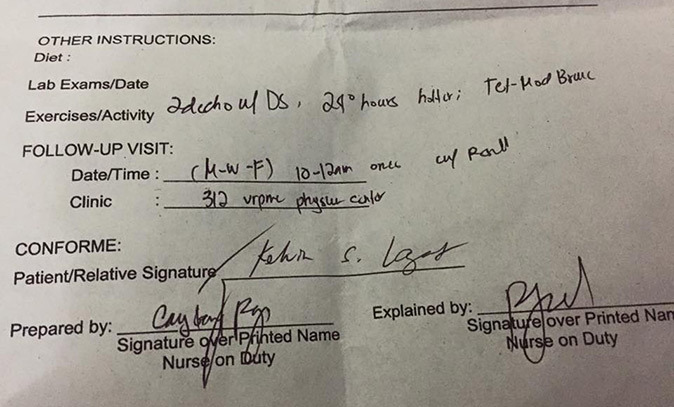 To show proof, Kelvin also uploaded his medical records and photos of him in the hospital, copies of which were provided to us by a source. Uber already called and apologized. Thank you to the supporters and bashers. You have the right to your opinion. I will close this case from here. Let Uber do their thing on this.